Harper’s Bazaar got the blues. A year later. That’s what they should call the movie about this massive cover fail. 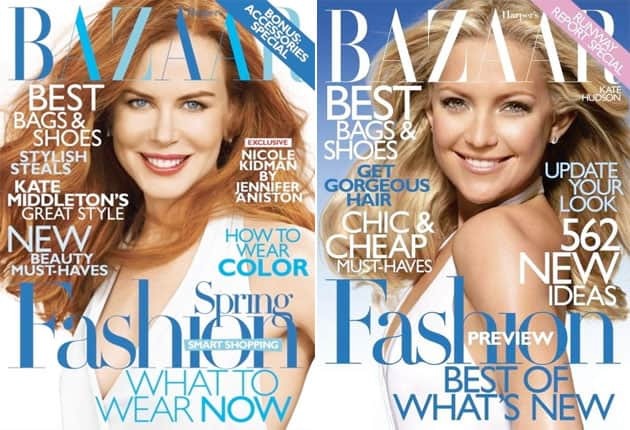 Harper’s Bazaar February 2011 issue cover (Nicole Kidman) is almost identical to Harper’s Bazaar January 2010 cover (Kate Hudson) from a year earlier. Both in styling and color. I know today the world is all about fast fashion, but did they think we’d forget that fast? To be fair you can’t blame them for Kate Hudson and Nicole Kidman having the same facial expression as that’s pretty much the standard and boring lady mag beauty shot. It’s unclear what was the reason for this mishap, but since Jezebel broke the story this evening it will be hilarious to watch it unravel tomorrow.